The T.Rex is the most famous of all the Dinosaurs; this stunning 11ft resin replica Tyrannosaurus Rex makes a great centre-piece for a pre-historic display. Our T.Rex model is 11ft tall and 22ft from jaws to tail. The detail on this model is fantastic. 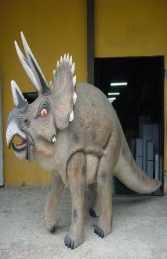 This spectacular statue is ideal to use with our other dinosaur models such as the Triceratops, Stegasaurus and Raptor replicas. PLEASE CONTACT US ON 01626 833646 or 07860 680181 TO DISCUSS THIS MODEL & THE OTHER FIGURES IN OUR DINOSAUR SERIES. PLEASE PHONE US TO PLACE AN ORDER & FOR A QUOTE FOR DELIVERY COST TO YOUR POSTCODE. NB -DELIVERY - Please note that the delivery price quoted through the website ordering system is based on delivery costs when the ordered item or items are sent through either a next day courier service (suitable for smaller models & figures) or, for larger items, via a pallet-line service according to the number of lorry pallet spaces required. For very large items the delivery cost represents an approx figure for a dedicated van/lorry delivery by ourselves. Wherever possible we try to personally deliver large items to your door when we can combine deliveries in an area; this does require flexibility for delivery date. Delivery charges on orders for multiple items will of course be discounted accordingly.